Whether you are interested in installing new flooring in your bathroom, redesigning the layout of your kitchen, building a deck around your property, or constructing a new driveway, it is always beneficial to consult with an expert. At Allpro Contracting, our Lombard remodeling contractors are here to help you get the most out of all your home improvement projects. Our professionals are adept at both interior and exterior remodeling services in Lombard, IL. The one constant in everything that we do is our goal to achieve complete and total customer satisfaction. This mindset is the key to our long term success. Since 1962, our remodeling company has sought to form long lasting and mutually beneficial relationships with all of our customers. Through the high quality results that we achieve, our team conveys the fact that you can trust us with all your future remodeling needs, from bathroom remodels to new patios in Lombard. Call Allpro Contracting today if you need to hire a professionally licensed remodeling contractor in Lombard. Our home improvement experts would be honored to assist you with your next project. We can answer any questions that you may have about your property or our skills and services. We would be very excited to schedule your appointment today. Your driveway has an immense impact on how you view, use, and enjoy your home. It is the primary walkway to your residence, and as such, it defines the first impressions that your friends and guests form of your property. At the same time, your driveway is absolutely critical to your family on a daily basis. If your driveway is old, unsightly, and inadequate, you should consider constructing a new one. 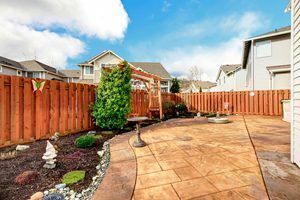 At Allpro Contracting, our Lombard exterior remodeling contractors specialize in concrete paving, driveway construction, walkway design, and brick pavers. With our help, you can create a driveway that will be perfectly designed for you and your family’s unique needs. You are guaranteed to be pleased with the results of our efforts. Your siding is in place to protect your property from the elements. At the same times, your siding defines the overall look of your residence. If you need to install new siding on your home, you should contact our professionals for help. We have the knowledge and skill necessary to help you select and install the most beautiful and protective siding material on your property. After our efforts, your property will look much better. Your new siding will protect your residence for decades to come. If you are looking for a professional Lombard remodeling contractor for patios, driveways or other interior and exterior services, then please call 708-658-3500 or complete our online request form.